Baltimore Orioles closer Jim Johnson has been perfect in the save situation, going seven-for-seven to start the season, closing out games with a high nineties fastball in his pitching arsenal. McGILLIGAN: One of the early story lines this season was the poor performance of closers. Teams were struggling to shut the door in the ninth inning and seal the win. Veteran guys – solid performers in seasons past – just weren’t getting the job done. Things have settled somewhat since then – injuries are still wreaking havoc in some cities – and part of the reason is new faces seizing their opportunities. The two best examples of this are Jim Johnson of the Baltimore Orioles and Henry Rodriguez of the Washington Nationals. Johnson has been perfect in his save opportunities this season (7-7), has yet to allow a run and has hitters off balance as evidenced by opponents mustering a measly.214 batting average. 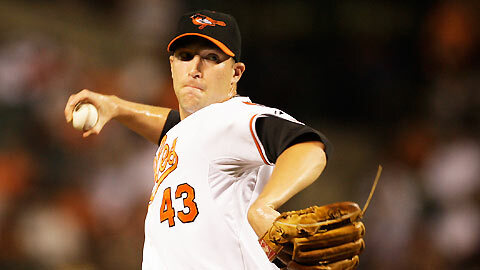 The Orioles have struggled to find consistency the closer role, only once in the past five seasons has a player recorded two-straight seasons of 20 or more saves (George Sherrill in 2008 and 2009). Heading into the year, Johnson had racked up 21 saves over the course of three seasons. Baltimore is a bit of a revolving door for closers, but early signs are positive for Johnson and the O’s. The most intriguing closer-related story is in the National League. After the Nationals watched Brad Lidge blow a few saves, the job was given to Henry Rodriguez who had a grand total of two saves before this year. This season he’s recorded five saves in five chances, has not allowed an earned run and has opponents hitting a paltry .038. What makes the Nationals situation so intriguing is the eventual return of Drew Storen. In 2011, Storen racked up 43 saves, tied for sixth best in all of baseball. He had minor elbow surgery earlier this month and could return sometime around the all-star break. If he can return to form, and Rodriguez continues his early dominance, the Nationals could have the makings of a great one-two punch for the eighth and ninth innings – in what order might be anyone’s guess.